HOMANN HEIRS. - Scandinavia complectens Sueciae, Daniae & Norvegia. . .
Scandinavia complectens Sueciae, Daniae & Norvegia. . . - HOMANN HEIRS. 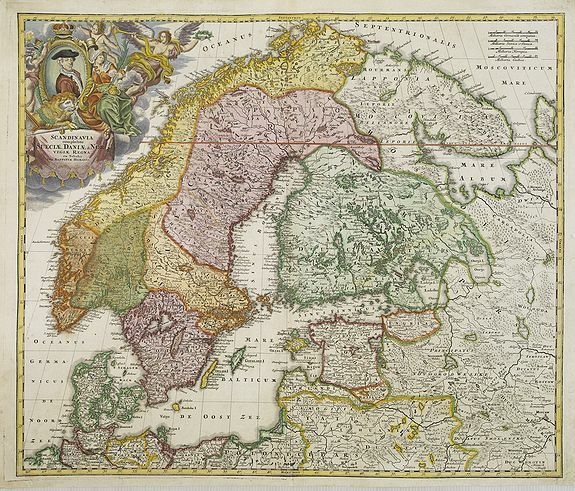 Title : Scandinavia complectens Sueciae, Daniae & Norvegia. . .. Size : 19.3 x 22.8 inches. / 49.0 x 58.0 cm. Description :Johann Baptist Homann's well-engraved map has a large decorative cartouche. Detailed map of Scandinavia. Condition : Good impression. Paper very slightly age toned.